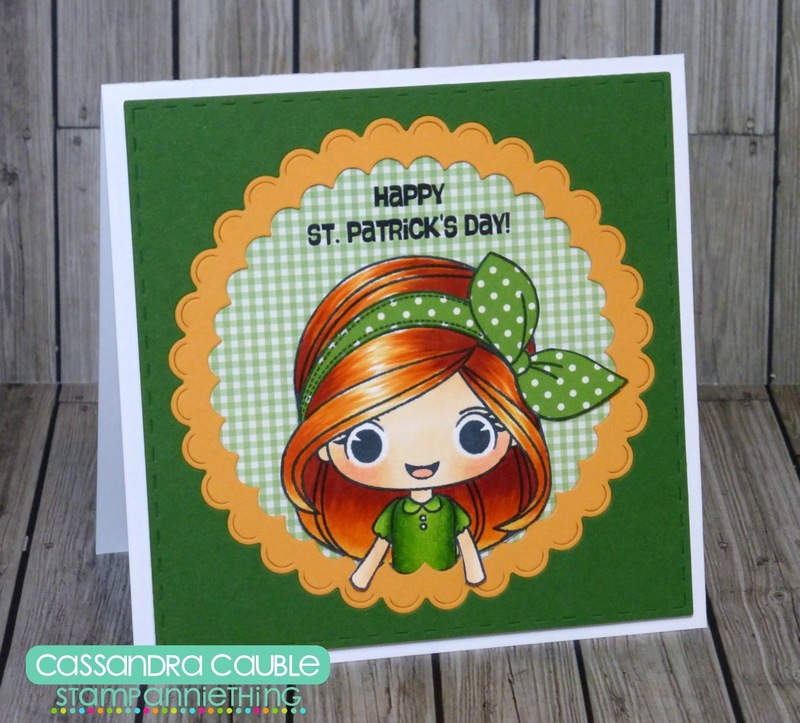 March Theme Week and Challenge ~ Day 4 with Cassandra and Annie!! 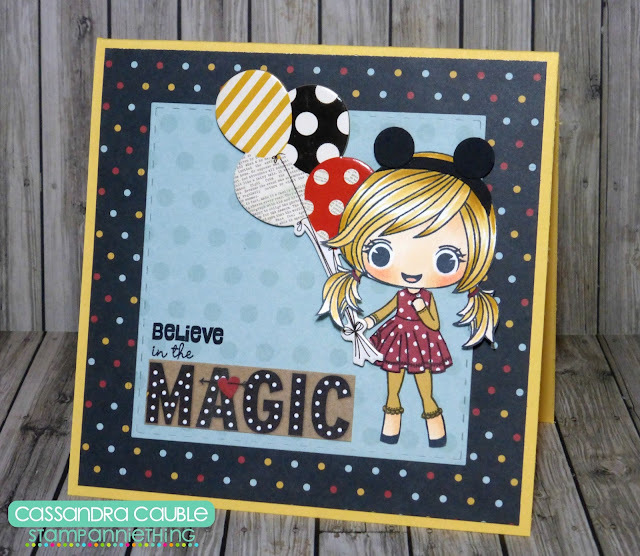 When I saw that the theme for this month was Polka Dots, I immediately thought of Minnie Mouse! Hee! So that was my inspiration for this card. This is the darling Stamp Anniething ~ Kelly : You're Purrfect. In her original state, she's dressed up for Halloween, but I changed her up a bit for this card. I colored her skin and hair with Copic Sketch Markers. And then I paper pieced her outfit and mouse ears headband. All of the papers, the balloons and the "magic" sentiment are from the Simple Stories ~ Say Cheese collections. I cut the blue piece in the background using the Jaded Blossom ~ Stitched Square Dies. The "believe in the" sentiment is from the Jaded Blossom ~ Easter Treats 2. I took the super sassy Jessica and put her on a standard A2 card that I matted with the Card Mat Dies. Again I used the Wine Tag die and Label dies to jazz it up! A Sentiment Thank You Die finishes it off! 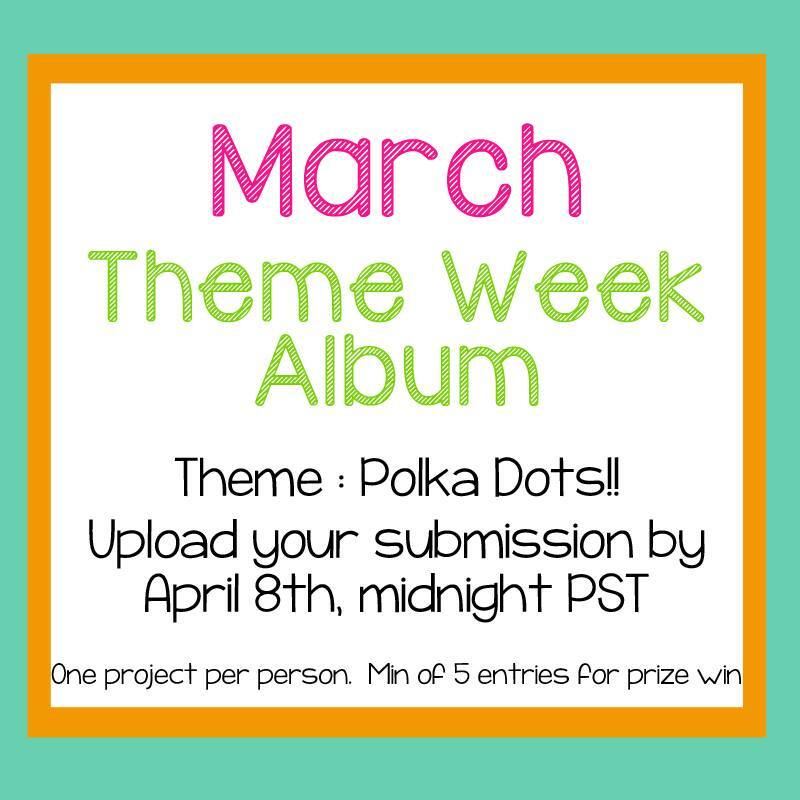 Polka Dot March Challenge Day #3! 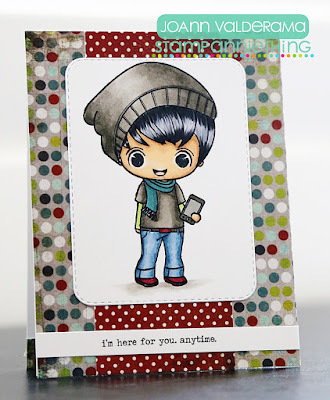 I know it's a Polka Dot challenge, but I thought that, instead of creating polka dots out of his clothes, I would search my stash for some perfect polka dot paper to compliment my card. So I decided to use some beloved Basic Gray paper I've had in my stash for a while! Totally perfect, right?! Please be sure to check out my blog for more details on how I created this card! 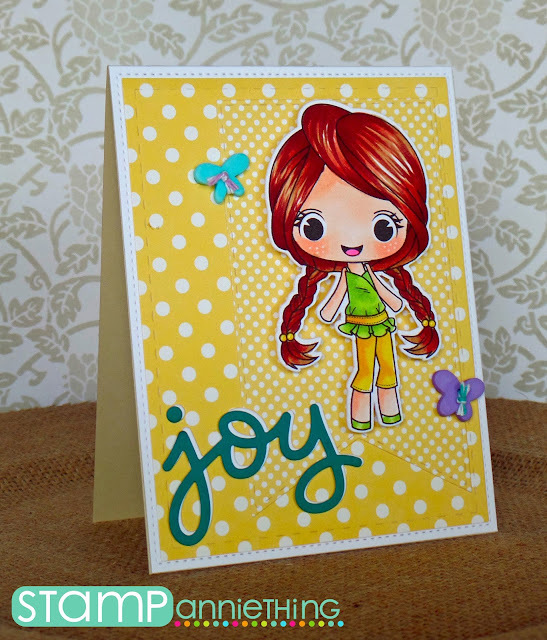 I used the Diana-Lets Do Lunch stamp set for my Polka Dot challenge card. I stamped Diana onto a mat cut with the Fancy Topper Die and colored her with Copic Markers. I added a decorative strip in yellow to the side, stamped the sentiment from the Dream In Color stamp set, and added gems. And now lets see what Annie made for today! I then took Brooke and scan and cut her and placed her on the Wine Tag Die. Some Doodlebug Design buttons and a sentiment Joy die finish her off! 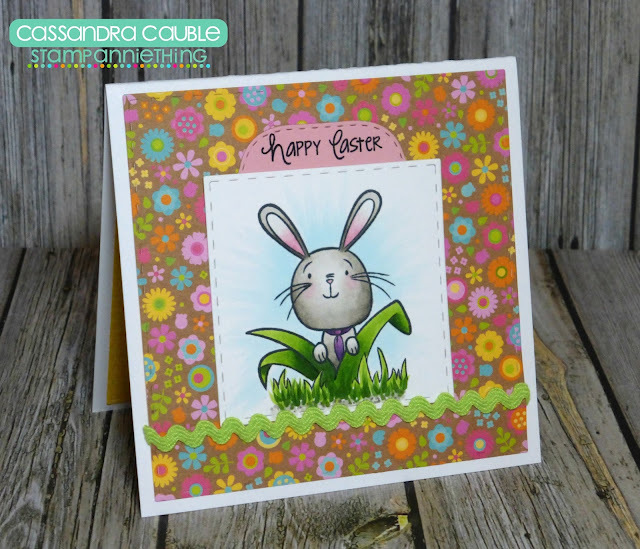 So today is Easter Monday so my card is Easter theme, Hope you all had an AWESOME Easter with your family. Here is my card... I used Stamp AnnieThing! 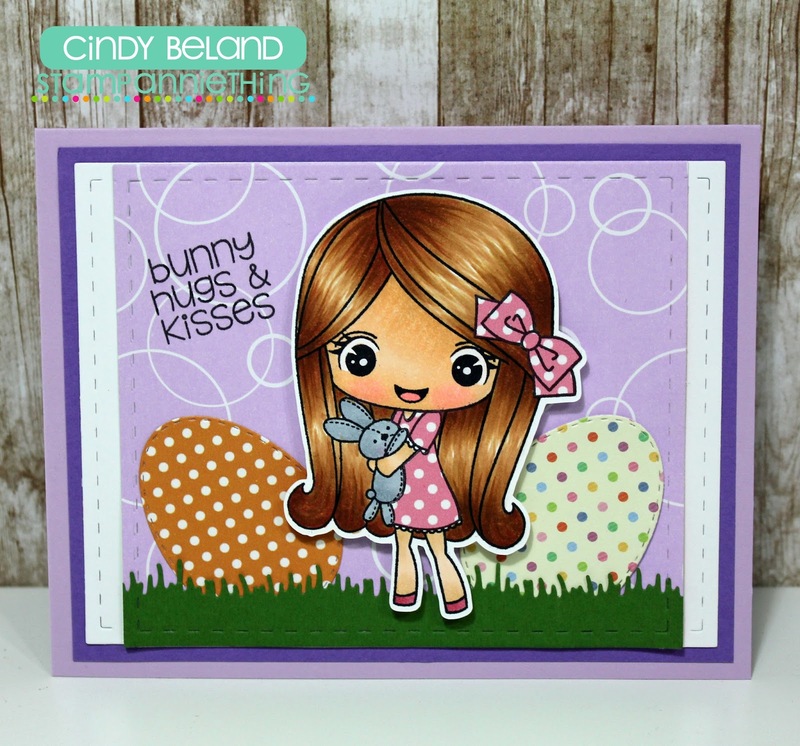 Melanie -Need a hug for the sweet girl and from Jaded Blossom I used Card Mat Dies for the bottom layers, the Spring Dies for the eggs and the grass and Honey Bunny for the sentiment. And here is Annie's project for today! I made Lorraine, one of our very first stamps! I added a fun doodlebug designs button on a label die and a hugs sentiment die. it went under the fence and she never found it again... now she has one that my baby named Henrietta. Henrietta is sort of grayish brown color and my kids love being around her especially my youngest daughter Daenerys. I used Copic markers to color her. For the bunny I used E70, W0, W1, W3, and a very tiny bit amount of W5. and I printed the poem on top. 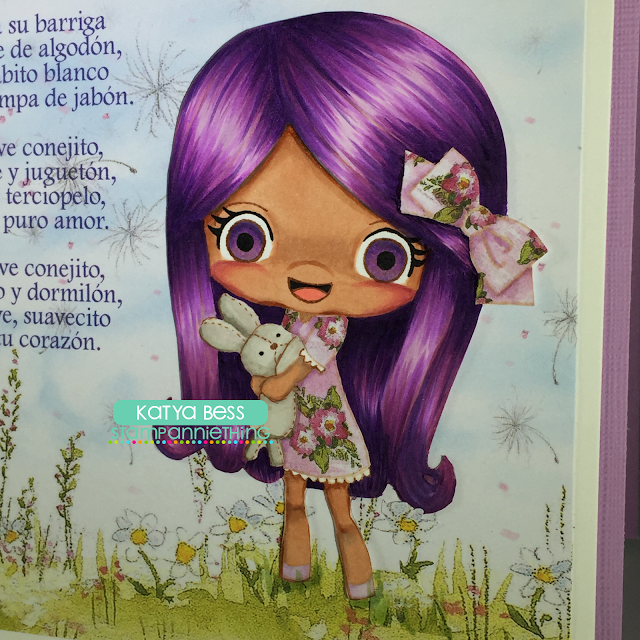 The poem/song is from a Spanish Gatorade commercial called "Conejito Pelucita" which translates to Fluffy Bunny but I'm not sure who wrote the poem.... It's a really cute though! Here is a close-up of my coloring and paper piecing. Hello! Melissa here with you today with a new project. I made this cute tag for an Easter Basket with For Peeps Sake Stamps. The background for the rabbit was made with the egg stamp. Copic Markers were used to color the rabbit and eggs. 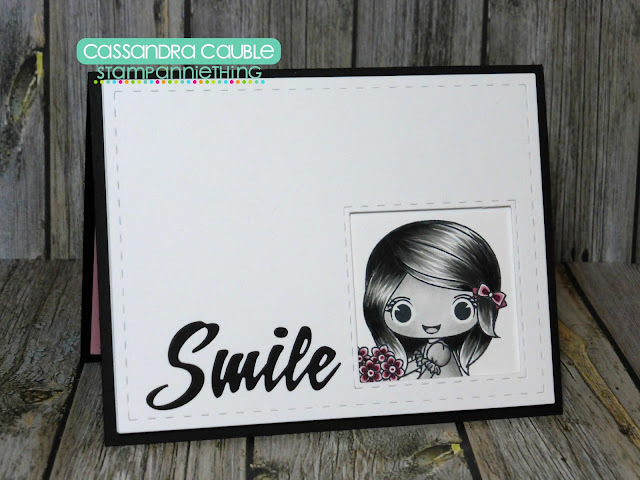 A Luggage Tag die from Jaded Blossom is used for the base. Here is a closer look at the Pink Bunny Tag. Hello everyone! This is Cassandra from Creating with Color by Cassandra. And today I have a sweet little Easter card to share with you. This is the sweet little Stamp Anniething ~ For Peeps Sake. I colored my little scene with Copic Sketch Markers. I cut the two square pieces using the Jaded Blossom ~ Stitched Square Dies. The little pink label at the top is cut with the Jaded Blossom ~ Label Dies. And the sentiment is also from the Stamp Anniething ~ For Peeps Sake. 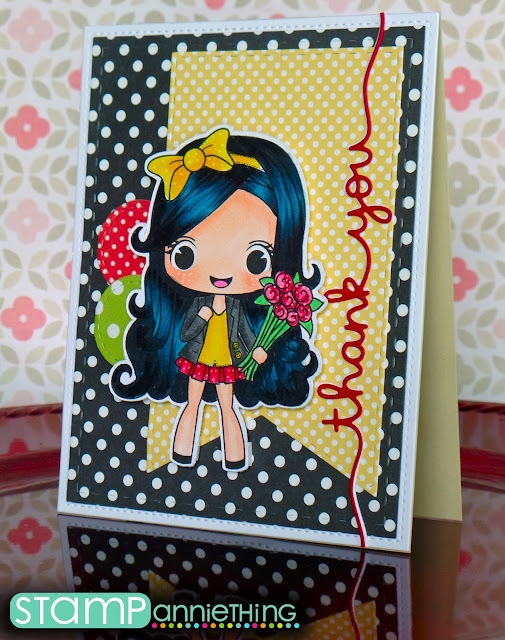 The pretty patterned paper is from the Doodlebug Design ~ Hello Sunshine collection. 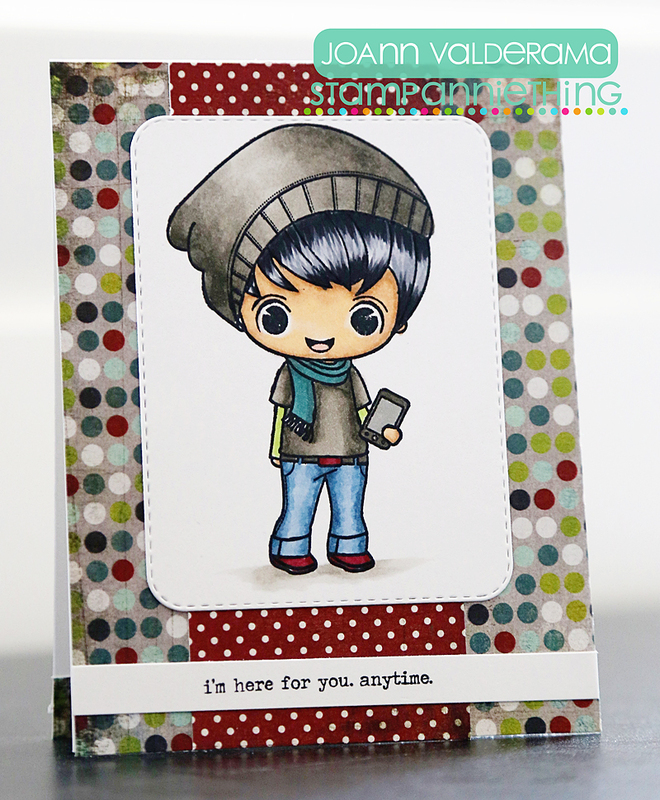 JoAnn from JoBoogie Stamping here with a new card to share with you this week! I used Megan (Glasses) for my project and although I've used her before on previous cards, I haven't used her with her adorable glasses! I just love the way she looks! I think this is one of my favorite more recent cards and I think she's SOOOO me. 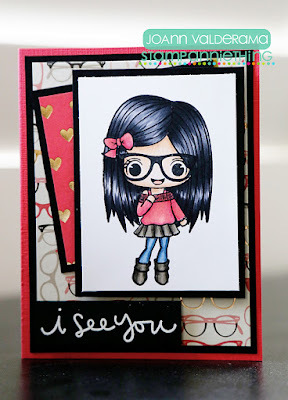 Black hair, glasses, and in pink - totally me! For more info, check out my blog! Thanks for stopping by today! Have a wonderful week! I used the Chloe and Sam-Love You stamp set for this card. I stamped and colored Chole and Sam with Copic Markers and cut them out. I layered them behind a frame I cut with the Layered Frame and Journal Die. 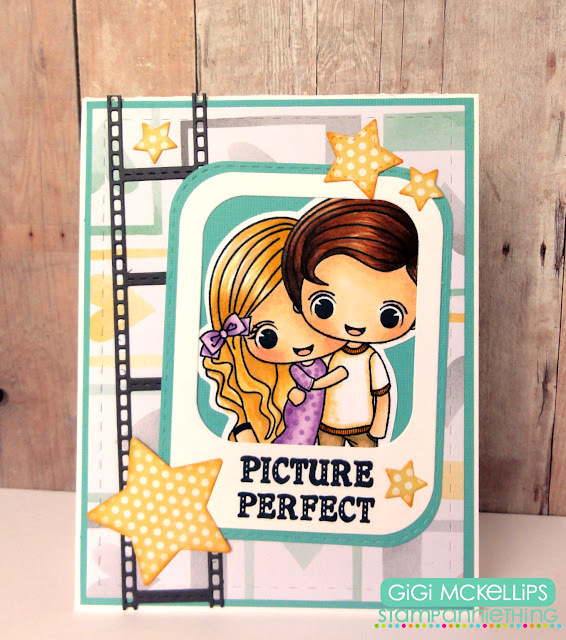 I added a film strip to the side I cut with the Film Dies and stars cut with the Star Dies. 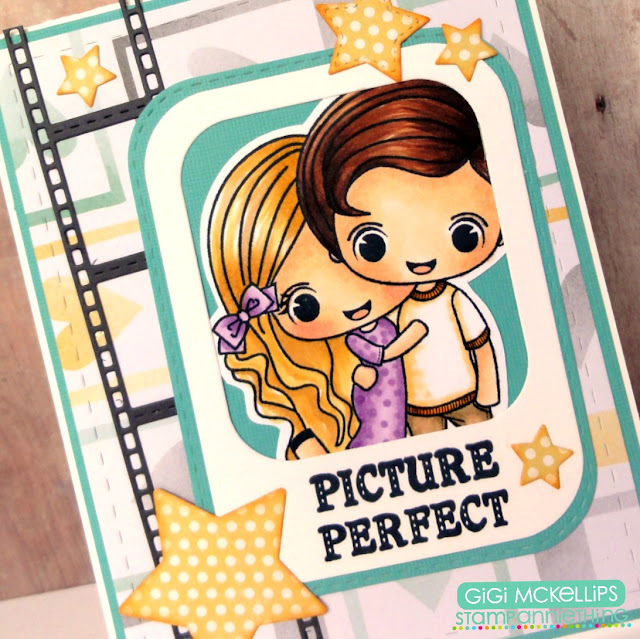 To finish, I stamped the sentiment from the Lights, Camera, Action stamp set. For today I made a summer time themed base card, I am so looking ford to summer!!! for the sentiment and the Spring Dies 2 for the sun. Audrina - Make a Splash. "Hmmm what colors should I use today?" and relaxing it's still time consuming. This is how I also chose my coloring... the weather and upcoming events. 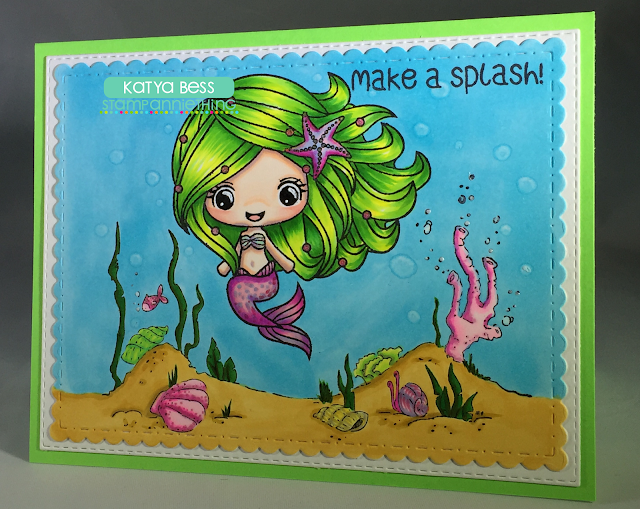 Audrina - Make a Splash was so much fun to color! water is constantly in motion and reflects lights and shadows in different directions. in fact, making them a little more wonky will make them somewhat realistic. I don't always follow light source since light is tricky but I try. I hope you get to try it out some day with this cutie. to give her some sparkle on her star and the pearls on her hair. enjoy it to the max!!! Hello! Melissa from Doxie Mel Designs with a new post for you. Here is a new card created with For Peep Sake stamps. This set has three rabbits to choose from and many accessory stamps to delight any rabbit (or human). 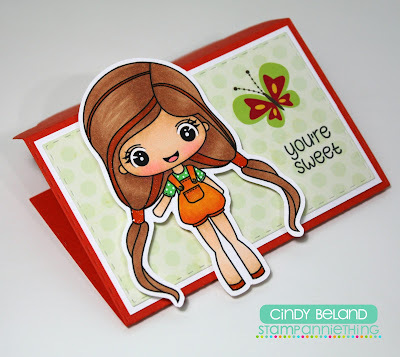 I created a background with a sentiment and carrot stamp. 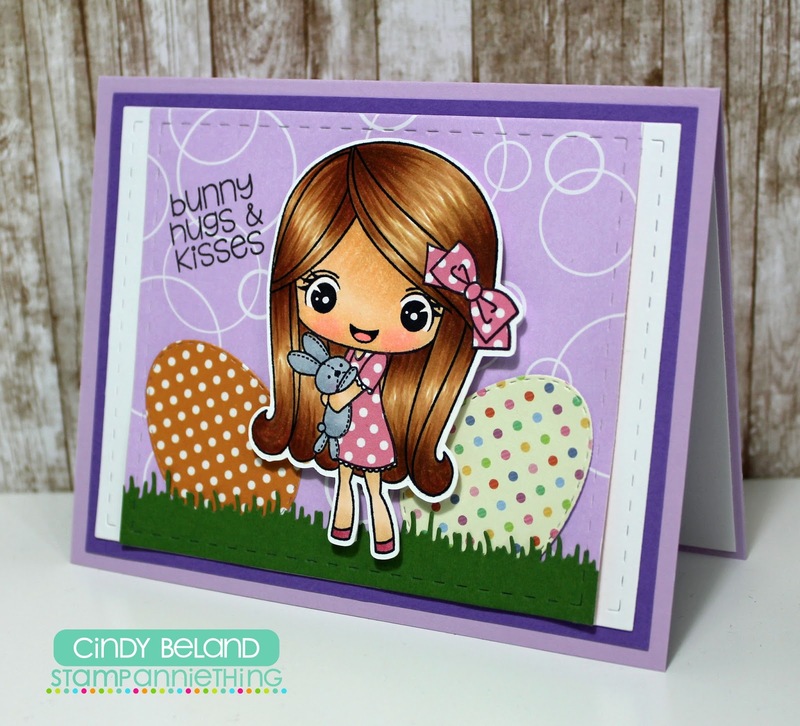 A stitched circle die from Jaded Blossom was used to cut a hole for the cute rabbit. This is a fun 4.25 x 4.25 size card. She is the cute little Stamp Anniething ~ Diana : Let's Do Lunch. 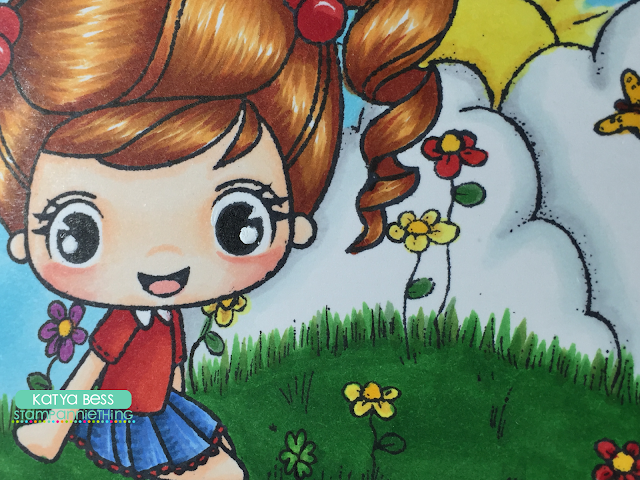 I colored her in with Copic Sketch Markers and paper pieced her hair bow. I cut the background using the Jaded Blossom ~ Stitched Square Dies and the Jaded Blossom ~Scallop Circle Dies. The sentiment is from the Jaded Blossom ~ Lucky Treats. Well my creative friends, that it for me today. Have a great day everyone! I will see you all again soon. 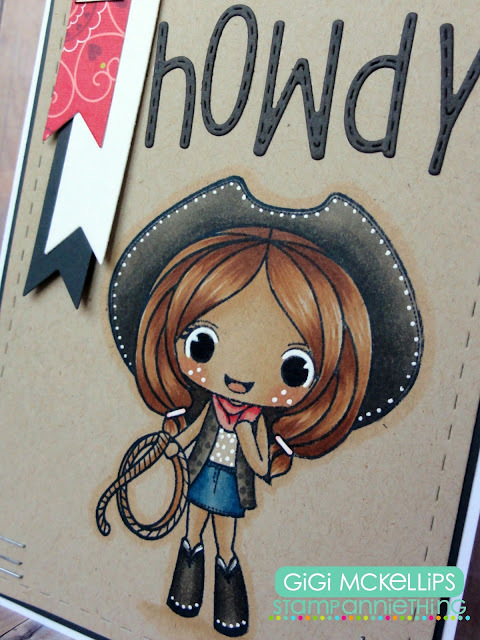 I used the Savannah-Howdy Partner stamp set for this card. I started this card with a standard A2 card base and added the mat in Neenah Dessert Sand cut with the Jaded Blossom Card Mat Dies. 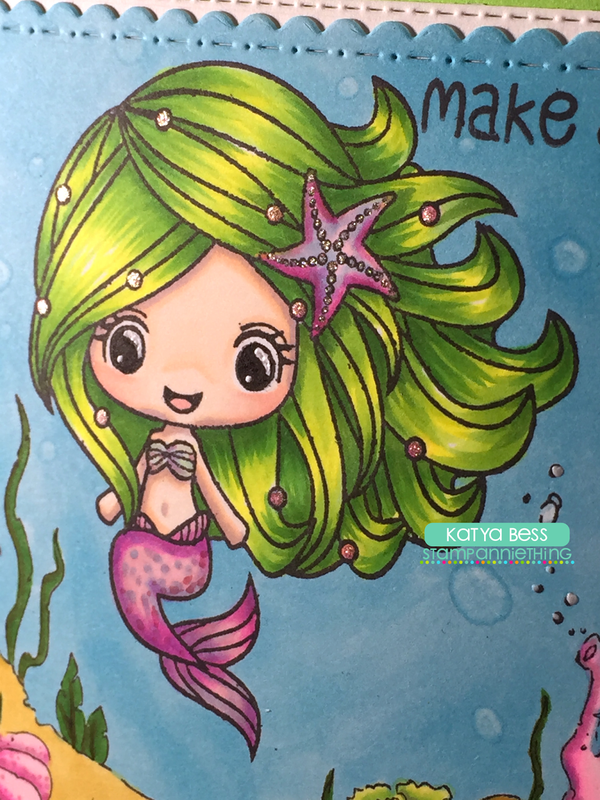 I stamped Savannah directly onto the kraft paper and colored her with Copic markers. The colors are alot different on this type of paper so I had to experiment a little to get this final look. I used a white gel pen to add all the highlights and outlined her in a light color. I added some banners to the corner cut with the Flag Dies 2 and used staples on the corners of the card. To finish, I added the "howdy" sentiment cut with the Alphabet Dies. Katya Bess here with a little card I made using Abigail - Glad We're Friends. 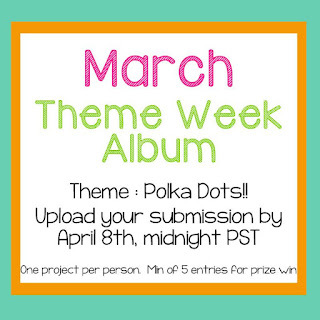 and also a theme for the month of March. to sit her out in a field of grass and flowers. 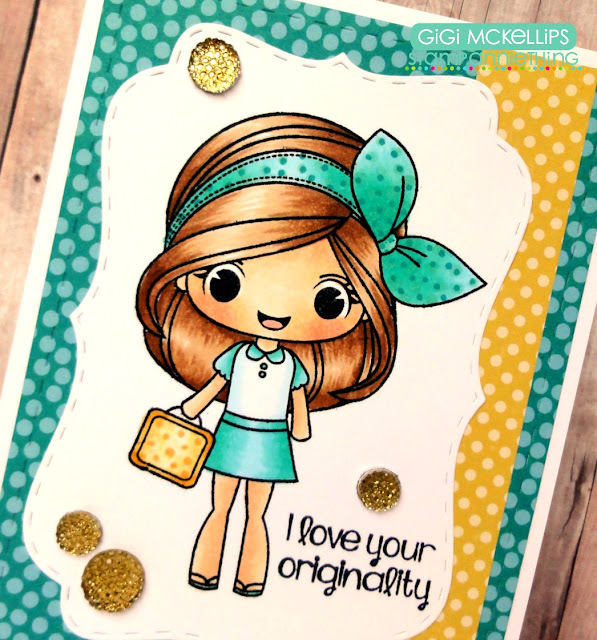 I stamped her first, then I masked her with "stamping mask paper"
after that I stamped the background, lastly I colored her up. Then I realized I wanted to draw a little four leaf clover on the grass. Very easy to create a full scene. but it doesn't look Christmasy. 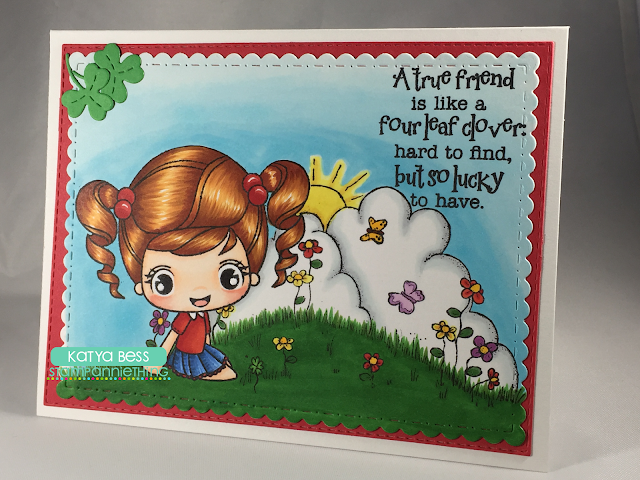 the background and the little four leaf clover I hand-drew. There are a few more details on my blog. and I hope you have a fabulous weekend. Hello Everyone! 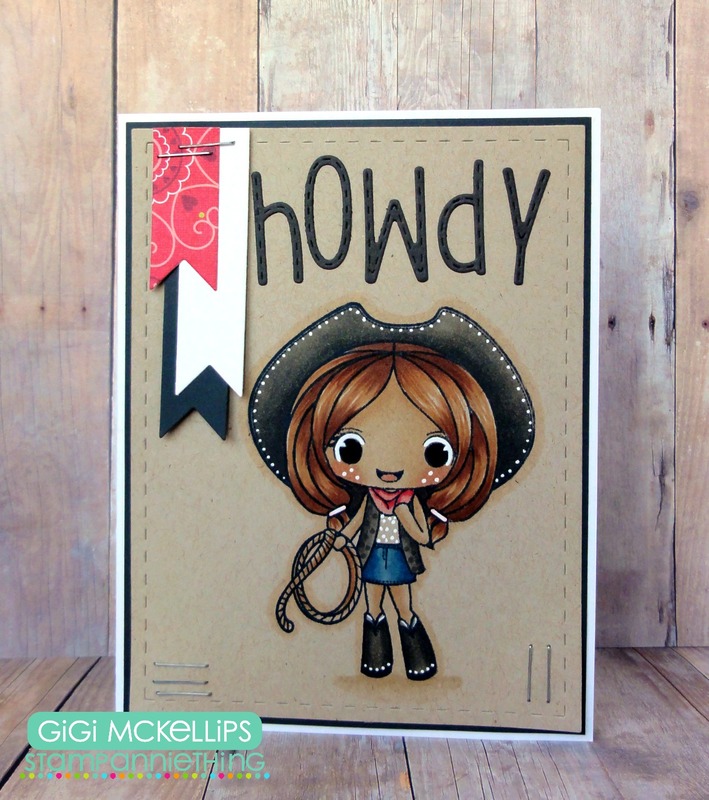 Melissa from Doxie Mel Designs with a new post. For my card today, I colored one of the stamps from the last release, Kelsey - Believe. Kelsey is colored with Copic Markers. The "smile" is a new die from Little Yellow Bicycle that I purchased at Hobby Lobby. I layered a few of them for a little more depth. Well, to be honest, I thought purple first but it looked a little washed out. I liked leaving a hint of the purple behind the teal blue paper. ;) To finish the card off, sequins! All fairies love the sparkle of sequins. Hello everyone! This is Cassandra from Creating with Color by Cassandra. And today I went a little clean and simple. This is a little "head shot" of the Stamp Anniething ~ Julie : Enjoy the Ride. Doesn't she look cute peeking out there? I colored her in with Copic Sketch Markers. I cut the background with the Jaded Blossom ~ Card Mat Dies. And I used the Jaded Blossom ~ Stitched Square Dies to cut the little peek-a-boo window. 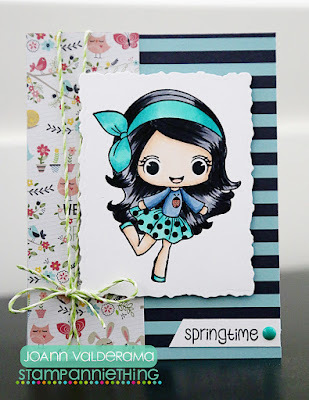 JoAnn from JoBoogie Stamping here with a new card to share with you using the new Danielle - Springtime stamp from Stamp Anniething! I'm really loving teals and blues for spring so I decided to color her up in my favorite colors of the moment, not forgetting to color that cute little ladybug on her shirt red, of course! I used some Spring-themed patterned paper in my stash as well to complete my card. I really love how it turned out! It really turned out to be a great birthday card. For more info, please stop by my blog! I used the Abigail-Glad We're Friends stamp set for this card. I used my sewing machine to stitch around the pattern paper pieces and stamped the sentiment from the 100% Hipster stamp set. 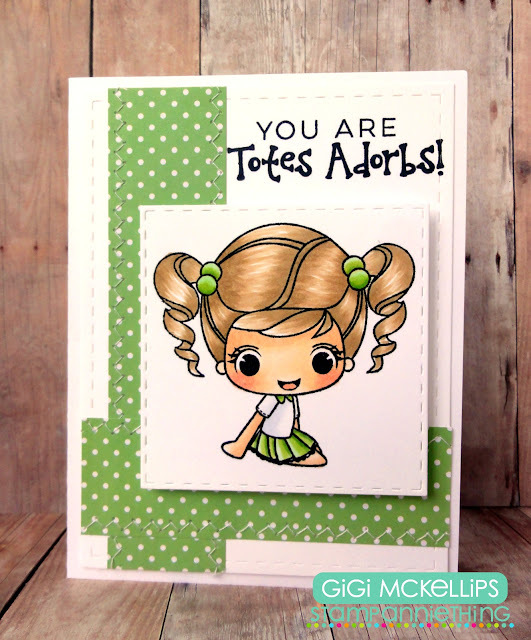 I stamped Abigail into the center of a Stitched Square Die and colored her with Copic Markers. To finish, I pop dotted the square mat to the card. at Stamp Anniething!!! I made this for one of my friends. I used Stamp AnnieThing! 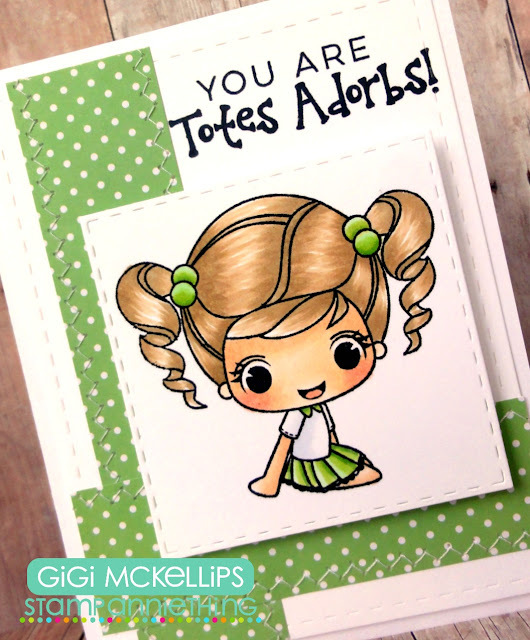 Lorraine - Hello for the girl and Annie - You're Sweet for the sentiment and from Jaded Blossom I used Folding Gift Card Die for the gift card base and the Gift Card Die to add my gift card inside and the Goody Bag Die for the top layer. March Release Day #2 - Julie - Enjoy the Ride! March Release Day #1 - Danielle - Springtime!